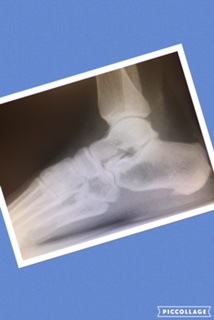 Center for Ankle and Foot Care Blogspot: What is a bone spur on the foot? Looking for foot and ankle advice? Heel pain, diabetic, bunion pain? We Can help! We have that and so much more, enjoy! What is a bone spur on the foot? What is a bone spur or heel spur? This is a question I get daily from patients that come into the office. They will describe classic symptoms that we see all the time with heel pain/plantar fasciitis. They get out of bed in the morning and they will feel intense horrible pain in their foot that often the describe as crippling or horrific! They come to the office and we take an X-ray to confirm there is no fracture. Then they see a big spur on the bottom of the heel bone and freak out, that this is the reason they are in so much pain! Not everyone who has a heel spur or bone spur, like pictured here, has plantar fasciitis or heel pain. But many people get a spur when their fascia is tight. The plantar fascia is a tight band on the bottom of the foot that commonly gets tight just due to our anatomy of our lower leg. The plantar fascia attaches the heel bone to the flexor tendons of our toes. Our calf muscle becomes our Achille's tendon that inserts across the ankle joint into the middle third of our heel bone. When our calf muscle is tight it pulls abnormally on the heel bone which in turn pulls abnormally on the plantar fascia. When this band get tight and contracted and you take a step, the fascia pulls on a thin membrane around the heel bone called the periosteum. This lifts or tents up and new bone is formed. This process usually takes a long time, it is your body's mechanism to try and spare you pain, but eventually if you keep ignoring the tightness of your lower leg you eventually are going to feel the pain of plantar fasciitis and it will most likely be the soft tissue that is your problem, not the bone! Explaining this to patients is very difficult sometimes because we like to see proof of why we hurt. But on X-ray you can not see soft tissue and it is not satisfying sometimes to the patient to accept this because, let's face it, plantar fasciitis really hurts! But even when patients have no bone spur they also are so upset because they can not believe something so simple is their problem! Treatment is the same for me when I treat patients with the symptoms with plantar fasciitis no matter if they have a heel spur or not. The hallmark of getting your heel pain better is stretching, icing and great support! There are cheater ways of stretching that I favor myself like a plantar fascial night splint. This is a device you can wear while you are sleeping, but some people can not stand wearing it all night. I had plantar fasciitis and I wore the splint whenever I was sitting down at home, so I would get at least 4 hours of stretching when I was watching TV or doing paperwork at home. This was one of the best ways to help stretch out that fascia and help your bone spur pain. Of course icing the foot and wearing a good support in your shoe help too! For more information about plantar fasciitis and bone spurs check out our website at http://centeranklefootcare.com/heel-pain.html. I have to undergo heel spur treatment in Singapore. Can no longer endure the pain that I'm experiencing. Plantar fasciitis and ICD10 coding, what do you need to know? Podiatry ICD-10 coding: The basics you need to know to be useful straight out of residency for billing!!! Is Your Pedicure Killing you? 2 Pods and a Pickleball....3 most common foot and ankle problems andtreatments for our active Pickleball Patients! ICD-10 Coding for Diabetic wounds, what you as a podiatrist should know. Are you frustrated with impending ICD-10 quickly approaching? We have made it a little easier for other podiatrists! Diabetic and don't have a foot doctor? Quickly three reasons why you need a foot doctor!! Ankle Sprain? How do I treat an ankle sprain?